Learn about the Research Assistance Program and how to contact your RAP specialist. The EH&S Research Assistance Program* unifies research safety support and auditing services into one efficient team of specialists who assist UC San Diego researchers with chemical, radiation, and biological laboratory safety needs. Contact the RAP specialist for your area. RAP specialists concentrate on specific areas, enabling them to understand the unique needs of each research facility. The information below highlights RAP team functions and responsibilities. RAP team members assist researchers when using EH&S web applications, providing user support and guidance. The My Research Safety portal provides a list of the tools available to lab personnel. Learn more about My Research Safety and how affiliates can get access to UC San Diego Business Systems. RAP team members consult when a lab must be closed, renovated or moved. Principal investigators are responsible for leaving vacated lab ready for occupancy or renovation. Learn about the process of closing a lab and relocating a lab. RAP specialists can assist your laboratory or department on a wide range of issues, including lab relocations, custom training courses, facility remodel plan reviews, chemical cleanouts, and much more. Ask your RAP contact for assistance with any issue that needs Environment, Health & Safety input. 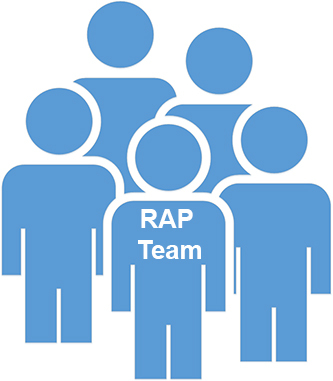 RAP team members can assist with incidents that occur within a lab, including investigations and reports. All UC San Diego employees must report injuries. Reporting delays can result in Cal/OSHA fines to your department. Learn more about reporting a work-related injury, illness, or hazardous material exposure. RAP specialists audit most campus research facilities for safety and compliance twice per year; low hazard locations are visited annually. Inspections are executed according to PPM 516 – Laboratory Safety which outlines the responsibilities for departments, Principal Investigators and Environment, Health & Safety. The principal investigator (PI) will receive a lab safety audit report listing counts of findings. Audit results help both researchers and EH&S identify and correct problems to achieve a safe work area and regulatory compliance. All findings identified in the audit report must be addressed by the Principal Investigator or their designee within the mandated time frame. RAP contacts assist incoming faculty researchers with completing their required New PI Orientation, as well as completion of their required Research Safety Authorizations. These processes can take time so it is highly recommended that you reach out to us early to ensure research operations can commence quickly and safely. * RAP is a service of Environment, Health & Safety – Research Safety Division.